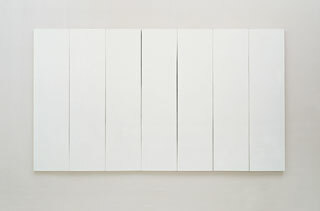 White Painting [seven panel], 1951. Oil on canvas, 72 x 125 x 1 1/2 inches. Collection of the artist. In the summer of 1951 Robert Rauschenberg created his revolutionary White Paintings at Black Mountain College, near Asheville, North Carolina. At a time when Abstract Expressionism was ascendant in New York, Rauschenberg's uninflected all-white surfaces eliminated gesture and denied all possibility of narrative or external reference. In his radical reduction of content as well as in his conception of the works as a series of modular shaped geometric canvases, Rauschenberg can be seen as presaging Minimalism by a decade. The White Paintings shocked the artistic community at Black Mountain, and word of the "scandal" spread to the New York art world long before they were first exhibited at the Stable Gallery in October 1953. While generally misunderstood at the time, the works were highly influential for Rauschenberg's frequent collaborator, the composer John Cage. Under the sway of the Buddhist aesthetics of Zen, Cage interpreted the blank surfaces as "landing strips" or receptors for light and shadow, and was inspired to pursue the corresponding notion of silence and ambient sound in music. His response, 4'33" (1952), consisted of the pianist sitting quietly at the piano without touching the keys for four minutes and thirty-three seconds so that incidental sounds in the surrounding environment—such as the wind in the trees outside or the whispering of audience members—determined the content of the piece.